Dr. Wayne Martin Koch earned a bachelors and masters degree in biochemsitry and molecular biology at Northwestern University before completing his medical education at the University of Pittsburgh, his home town, in 1982. While a medical student, he was encouraged to pursue Otolaryngology by Eugene Myers and Jonas Johnson. Subsequently, he went on to Otolaryngology residency at Tufts and Boston Universities (combined program) studying under Drs. Stuart Strong, Charles Vaughn, Werner Chasin, Gerald Healy and Stanley Shapshay. 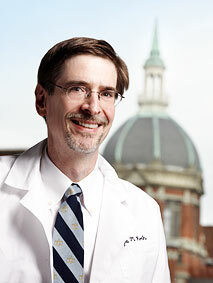 In 1987, he went to Johns Hopkins to launch a career as a clinician scientist under the tutelage of Drs. William Richtsmeier, John Price and Michael Johns, Jr. In 1989 he joined the faculty of Johns Hopkins Department of Otolaryngology-Head and Neck Surgery where he has now served under four chairmen, Drs. Johns, Mattox, Cummings, and Minor. He is currently the director of the division of head and neck surgery. Dr. Koch was named to the council of the American Society of Head and Neck Surgeons in 1997, later serving in the first combined council of the new American Head and Neck Society, and becoming its Secretary in 2001-2004. He has worked on initiatives for upgraded valuation of head and neck surgical codes together with the leadership of the American Academy of Otolaryngology-Head and Neck Surgery and the diligent efforts of AHNS volunteers culminating in a substantial improvement in RVWs for 23 of our most common surgical procedures in 2005. Dr. Koch’s academic endeavors have focused on clinical applications of molecular markers for head and neck cancer, particularly focusing on the detection of p53 gene alterations and more recently hypermethylation of tumor-specific genes in surgical resection margins and saliva and serum screening samples. This work has been continuously supported by the National Institute of Dental and Craniofacial Research for over 10 years, and represents a most fruitful collaboration with Hopkins colleagues, David Sidransky, Maura Gillison, and Joseph Califano. Dr. Koch has coauthored over 110 manuscripts in peer-reviewed journals including five published in the New England Journal of Medicine.